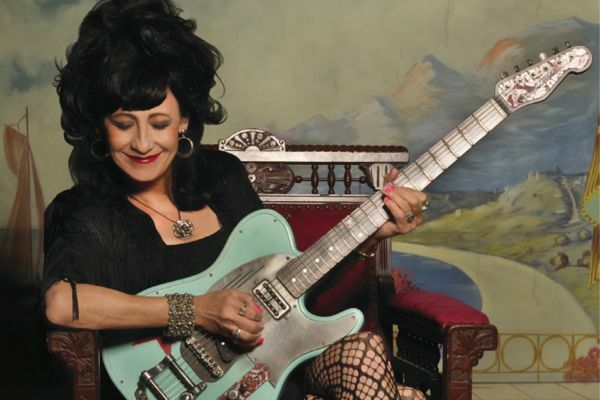 CD Review: Rosie Flores "Working Girl's Guitar"
Rosie Flores is the musical embodiment of the term “she’s been around the block a few times.” Over a prolific 30-year career, she fronted cowpunk band the Screamin’ Sirens, became the first Latina singer to enter the Billboard country charts, toured with Wanda Jackson and established herself as the Rockabilly Filly recording albums for Reprise, High Tone, Rounder and a half dozen other labels. 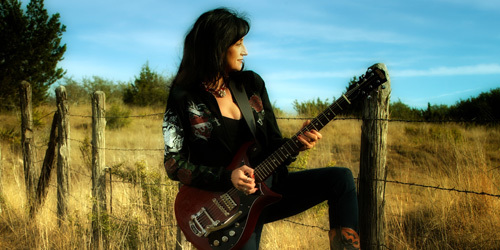 Her current home is alternative country’s powerhouse indie Bloodshot Records. Working Girl’s Guitar (released October 16th, 2012) is a rocking, rolicking, doozy of a follow-up to Bloodshot debut Girl of the Century. Flores is a mighty fine singer; at times she channels Liz Phair and the Breeders’ Kim Deal as much as Wanda Jackson and Loretta Lynn. The real star of the show is her sizzling guitar prowess. The album’s strongest moments come when she lets her fingers do the rocking. Considering the subject, you would expect there would be MORE guitar on the title track, but it’s primarily a showcase for Flores’s vocals riding proudly atop a galloping drum beat. Patience is rewarded at the 3-minute mark when she unleashes the first of many sinister solos. “Little But I’m Loud” is a cowpunk cousin of Phair’s “6’1” — it’s a sassy, blusey number that shows at age 50(ish), Flores still packs a mighty punch. The guitar barks at 1:45 and but she doesn’t release it from its cage until 2:45. When she does, it tears up the yard. Things slow down for the dreamy, Breeders-ish ballad, “Yeah Yeah.” This tribute to the late Duane Jarvis gets a lovelorn pedal steel assist from Greg Leisz (Dave Alvin, Wilco, Robert Plant, Bon Iver). Time and again this song blissfully transported me from bumper packed Seattle traffic to star-filled big sky country. Even though Texas has plenty of coastline, you don’t easily associate it with surf music. Instrumental track, “Surf Demon #5,” mixes Doors-ish organs with Duane Eddy guitars for 3-minutes of what I can only describe as Texas Munster Surf Rock. Flores bows to the late Janis Martin with a cover of “Drugstore Rock and Roll” — a 50’s number straight from the Arnold’s jukebox on Happy Days. The Working Girl’s Guitar album comes right on the heels of Martin’s 2012 posthumous album, The Blanco Sessions, that Flores produced by fleshing out the master tapes Martin left behind. One of Working Girl’s Guitar’s brightest moments comes on the heartbreaking duet “Love Must Have Passed Me By.” While the vocals are exquisite, especially Bobby Vee’s Willie Nelson-ish croon, the real heartbreak here comes from Flores’s teardrops by the campfire guitar line. “Too Much” gets the booties scooting once again. Flores is all sass and swagger on the vocal and her guitar spikes the punch. Rosie makes this delicious, wicked song so much her own, I had no idea it was an Elvis Presley cover. “If (I Could Be With You)” is a soulful doo-wop country barnburner that would have saved the Blues Brothers’ bacon had they trotted it out while posing as the Good Ole Boys in the stage cage at Bob’s Country Bunker. The album closes with “While My Guitar Gently Weeps.” While this oft-covered classic is covered nicely here, I would have much-preferred another uptempo rockabilly number original to close the set. The vocals are a bit out of her reach and the slowed-down pace tends to drag a bit before fading out altogether. 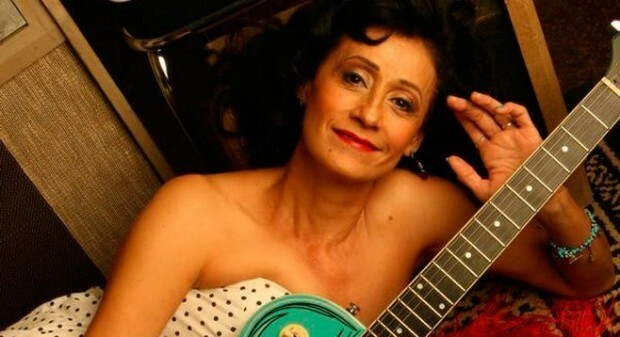 You could almost call it, “While My Guitar Gently Sleeps.” I think Flores is much better served doing originals and covering lesser known tracks from the vaults of her heroes. Thankfully, in this iPod era, with one click I am forwarded straight into “This Cat’s In The Doghouse” — the standout single from Flores’s last album. And thus the party continues long into the night. 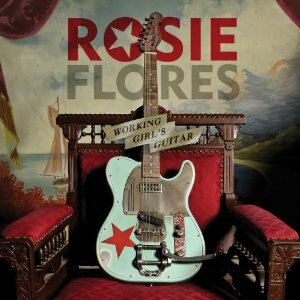 Whether your thing is rockabilly (Elvis, Wanda Jackson), psychobilly (Reverend Horton Heat, Tiger Army) or “what the hell is that awesome song in the closing credits of Bridesmaids?” (Jackson’s “Shakin’ All Over” produced by Jack White), Flores’s Working Girl’s Guitar is the perfect album to keep you shaking, rattling and rolling all winter long. Working Girl’s Guitar is available October 16, 2012 at Amazon.